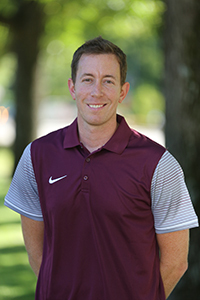 Clint Woods, in his fourth season as head coach of the College of the Ozarks men’s and women’s cross country teams, has seen his team steadily grow and improve each year. While working diligently to train his athletes and build a strong program, Woods strives to challenge each runner to pursue continued improvement throughout the season. With this goal in mind, it is anticipated the team will have several runners once again qualify to participate in the NCCAA and NAIA national competitions this season. Woods holds a Bachelor’s Degree in Corporate Recreation/Wellness and a Master’s Degree in Recreation from Northwest Missouri State University. Prior to coming to College of the Ozarks, Woods has served as head men’s and women’s tennis coach at Oklahoma Wesleyan University, men’s director of Bartlesville K-Life, and women’s basketball graduate assistant at Northwest Missouri State. He attended high school in Nixa, Missouri, where he played tennis and basketball. Clint and his wife, Angie, came to College of the Ozarks from California in 2013. In addition to leading the cross country program, Woods currently teaches in the Physical Education Department. If you are interested in joining the Lady Bobcat Cross Country team, please complete the Lady Bobcat Cross Country Questionnaire.